And man, am I still tired? but I was pooped. I'm still pooped...and it's Wednesday. I was really excited about this race, because it kicks off the Heartland 39.3 Series and my company PRA decided to be one of the sponsors, so unlike most races I had a gaggle of family and friends there running also. My goal for this race was to run it in under 2 hours. Thinking that a sub 2-hour half would get the ball rolling for the spring in a big way. I have been training relentlessly, and it was attainable. 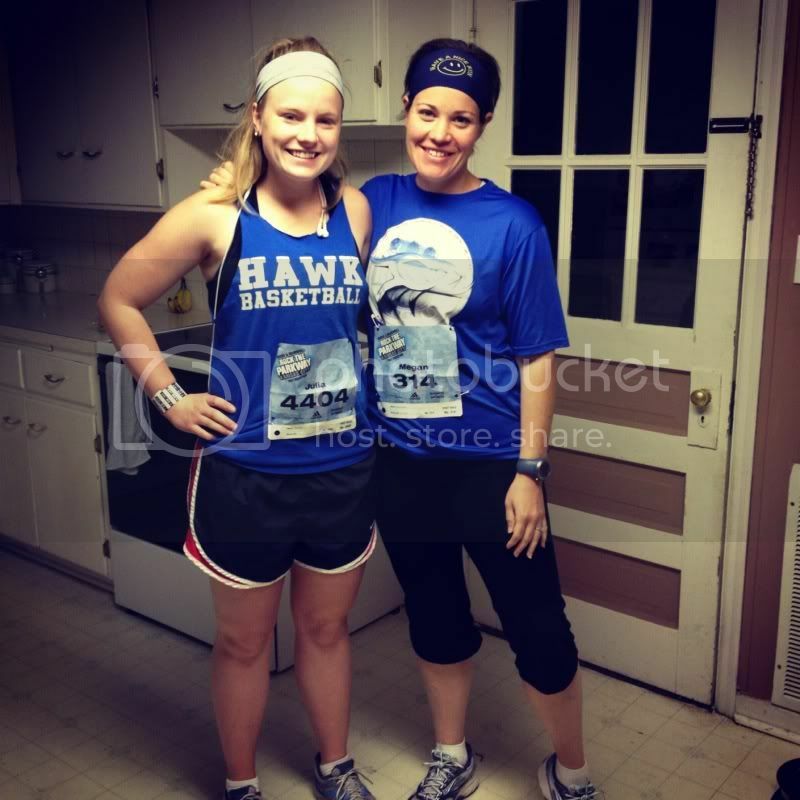 My long-distance-long-distance Running Love!! Pre-Race. The Race started at 7:30, and it was kind of hectic. As usual, I had planned on getting there earlier and it just didn't happen, so I ended up getting pretty stressed out. Also, large groups of people are kind of annoying to me-a terrible phobia for someone who's addicted to road races. I was suppose to have baller status parking, and we couldn't find the lot and we ended up trying to walk to the start and my shoes got all wet, and I whined a lot about it. Anyway long story short, Megan and I got separated at the start but I met my dear friend Mary, who was running her first (!!!) 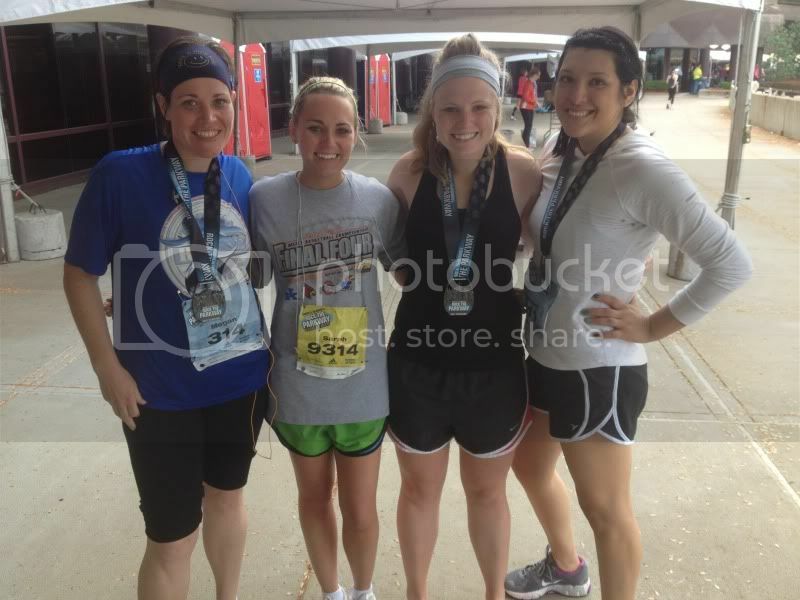 half marathon. The race was off and the humidity was really thick. I hate it when you sweat, and it doesn't go anywhere, it just stays on your skin. Sitting there...all wet...and hot. GRossss. I decided to try and line up with a pace group, but turns out I am also not a fan of those. People get really weird about trying to stay near the pacer. There were runners who were doing everything short of throwing elbows to get people out of their way. It was really crammed and made me feel really anxious. So I drew back and slowed so they could pass. The first few miles were easy peasy, nice and slow but I still felt like I was going too fast. 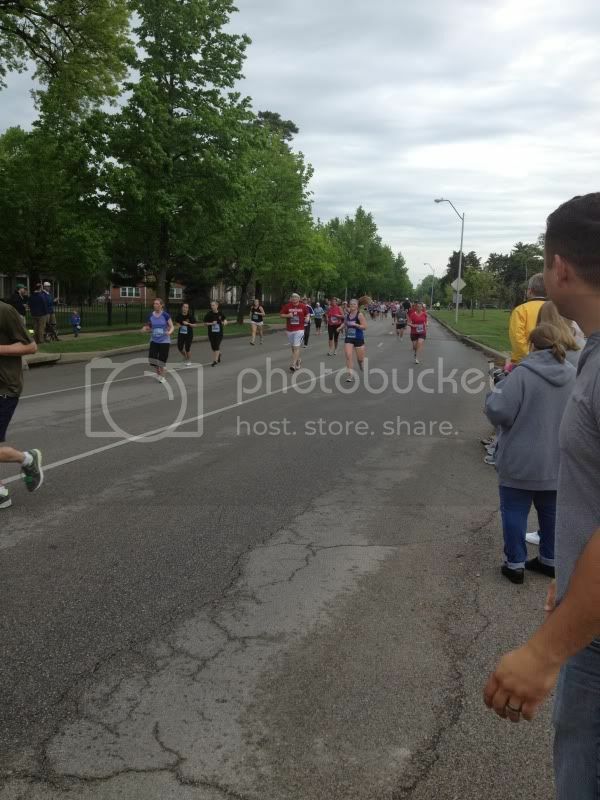 By like mile 4, I started to notice that I was turning over my left foot in an odd way. Like my shoe wasn't tied right or, the unlevel road was making me strike funny? Around Mile 6, I noticed a familiar pain in my left knee. No doubt from the odd strike pattern in my left foot. I started to get really discouraged. 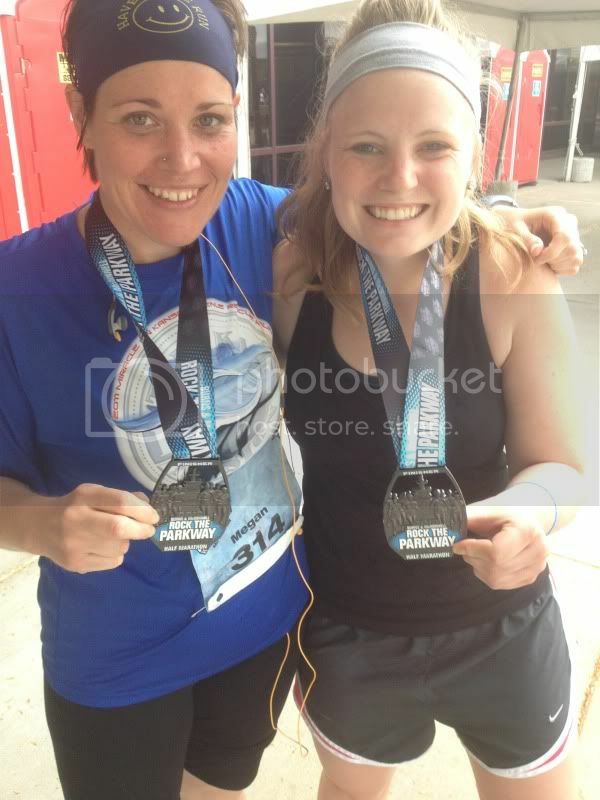 I started to think about not finishing the KC Marathon, and how crappy that felt. Around Mile 7, I slowed myself waaaay down. I was exhausted, pretty much out of gas and starving. I didn't eat or drink anything before the race, and only water so far during. I am struggling with GI issues while running, and want to find a happy medium. I switched to gatorade mid-race hoping that would help. For the rest of the race, my pace was slower than anticipated and I knew I wasn't going to hit my goal. I was pretty defeated, there's nothing like forcing yourself to finish when what you wanted to achieve is out of the question. But running a half marathon is an achievement in itself, so I should be proud each and every time. I finished with a smile on my face, and that felt awkward. Physically I could have done more, I just didn't have it in my knee or my energy to get the job done. I ended up finishing 20 minutes over my goal. Ouch. The course is beautiful. Of course I am going to say it's an amazing race :) I will be back. Hopefully faster. Well Saturday was race day, and boy was it ever. If you were to put everything that you don't want to happen on race day in a hat, I drew them all. I had no sleep, my ride was late, my esteem was low, it was pouring rain and freezing and there was a giant head wind. Lining up with my pace group was really intimidating, and before gun time I considered bowing out. For some reason, the day before I had to continually mentally talk myself into this one. I think a lot of my nervousness had to do with my very poor performance in my last half. Less the never, I showed up. I ran. I conquered. There was a lot more support there than I had anticipated for an inaugural race. We were told it was a really flat course, but someone was either lying to delirious. Running uphill is exponentially more difficult with a current of fallen rain, but we persevere. Mental frailty will not give you satisfactory results, so sometimes you have to convince yourself that your the biggest, baddest runner out there-even if you know you aren't. That's what running is about anyway right? Believing that you can push yourself to do something you probably weren't made to do. The decision was made early in the race that I wasn't going to walk one single step, unless forced at a water station. I decided that no matter what, I had to be going at the pace of at least a speed walk. You know the lies we tell ourselves to make things a little easier on the ego? Like Oh, it's ok to walk you've done so well so far! Those nice little sweet nothings that justify an action? Well, I was mean. I was really mean to myself. If I told you what I was saying to myself, you would probably be disappointed. To get through this race, I did everything in my power to keep pushing. I literally thanked every volunteer, every police officer and nearly every cheerleader-even if they weren't there for me. Just pretending they were there for me, kept me from disappointing them and eventually myself. But the most important thing that kept me going was telling myself: pedicure, pedicure, pedicure. It worked. 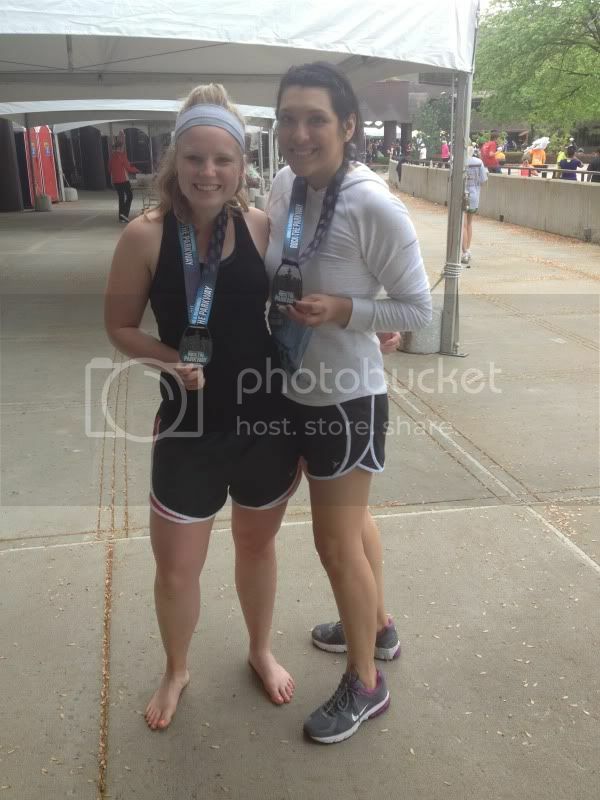 I ran the whole darn thing, and even skipped a few aid stations-which I like never do. The only thing that could have improved my time was skipping the absurdly long line for water at mile eight and maybe halting the rain? The ice bath after was painful, but the pedicure made it worth it. That should become a ritual for races. TODAY'S THE LAST DAY FOR CHALLENGE POINTS!!! TODAY'S QUESTION: How do you reward yourself after a good run? Any amount will get you 20 points. Also, if you have linked TBB anywhere, please show me so I can add those points! Today's Challenge Question: What are your ideal racing conditions? Weather, participants, with a group or alone?? Being back in control feels phenomenal. It's not always the easiest position, but it always pays off. Now, to just figure out how to keep my attitude from wavering like a sine wave. When I'm at my apex, Goliath and I have the best runs. They might not be the best training sessions but they are always fun. With a marathon in view, we are technically tapering but really we're just taking it easier and aiming for twenty minutes of activity every day. Don't fret we'll rest completely on Friday. In the midst of everything and "tapering" we are 188 days out from a full 26.2 miles. So we are loosely sticking to that plan and all the while making it work with all our other races, and impromptu runs. Our coach called for a four mile, easy run today. Which we set out for as per normal, except my NIKE+ started acting up. Without getting into too much useless details, it wasn't giving me the distance options it usually does, and even though the settings were on "Miles" it was giving me my distance in my ear. Unfortunately, I do NOT like trying to do math in my head. One kilometer complete...welllll five kilometers is threee point one miles soo... As much as it sounds like a nice way to distract you, it was just irritating to me. So we had to reset the workout twice and it didn't log the whole four miles in one work out. Oh well? I was running aphrensively, and I hate running that way. Even though ice has been my best friend lately, I am really not that fond of pain and am starting to learn that it's smarted to avoid the dive into injuries. We did this crazy thing called WARMING UP, who does that? Goliath and I usually run door to door. We are acustomed to that, we know the mile markers and we know the hills. Today, we walked a half a mile and started our mileage after that. We ran three miles out, and found a baseball diamond. I let G-Money go nutso. Sometimes I feel like he runs with me a pretends that it's enough, just to appease my ego. He ran back and forth, smelling everything. We played tag, and fetch with a ball we found. The pure physics of his energy is unexplicable. The run was a good one. The weather was beautiful. The trail was full of smiling faces. The pain was minimal. We got a good work out. We got some miles on the shoes. We stuck to our plan. and of course, we got a little muddy. Today's Challenge Question: When was your last perfect run? Describe it! I have been a lazy blogger, among other things. So this will be WORLD'S shortest post on TBB. I'm still feeling some residual pain from the groin tear, and with a half marathon a week away I have been trying to get it to heal as much as possible. The only running we did last week was the 2 miles on Monday, and a 5 miler on Thursday. How do you taper for a half marathon on 9 miles a week? Ha. This week, my schedule will be back to normal and with a race in view maybe my hip will realize it's high time to heal. We got like 800 inches of snow this weekend, only Goliath is happy about it. What's your favorite running food? Want Challenge BONUS points? Email Goliath and I a picture of you and your favorite running partner, whether two legged or four; and tell us what got running. Pictures and stories will be posted on TBB.